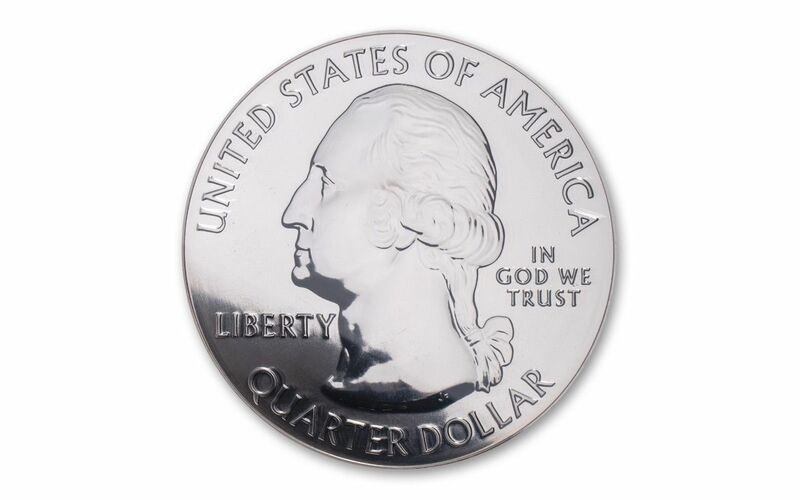 Each year, the U.S. Mint releases five new coins in the America the Beautiful Quarters® series. Since 2010, that series has also included versions struck in five full Troy ounces of 99.9% fine silver! This is the first five-ounce, three-inch, 99.9% fine silver bullion series ever produced by the U.S. Mint, and it’s the best way for you to capture and examine each year’s gorgeous designs. 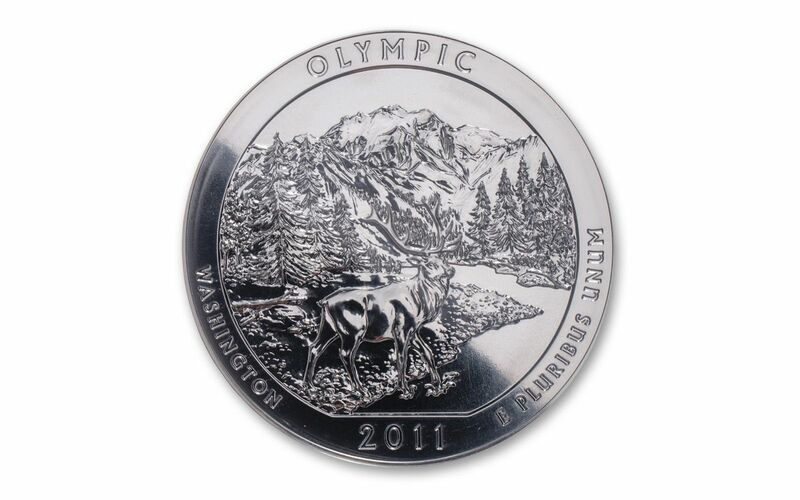 This particular coin is the third release from 2011 – Washington State’s Olympic National Park, featuring a majestic Roosevelt elk standing in the Hoh river before a snow-capped Mount Olympus looming majestically in the background. This coin comes graded by the Professional Coin Grading Service (PCGS) as being in near-perfect Mint State-69 Deep Mirror Proof-like condition (MS69 DMPL), meaning its shine is so great that it almost qualifies as a Proof coin! That makes sense, as the coin is also certified as First Strike (FS), placing it amongst the first of the mintage. Your coin will also come sealed with a label hand-signed by John Mercanti, 12th Chief Engraver of the U.S. Mint. With so much going for it, our limited supply may not last – order now! 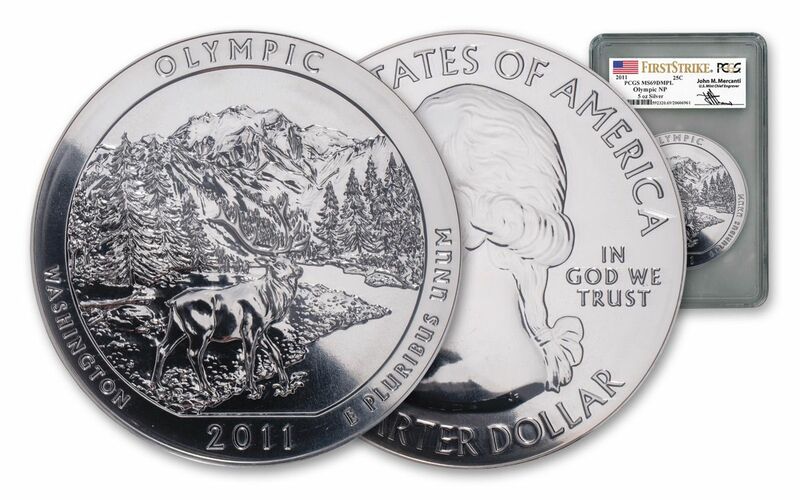 BEAUTIFUL ADDITION TO THE AMERICA THE BEAUTIFUL SERIES – This 2011 Olympic National Park Five-Ounce Silver Coin is the third issue of 2011 and the 8th overall in the America the Beautiful series, which began in 2010. GRADED IN NEAR-PERFECT UNCIRCULATED CONDITION – Your coin has been graded by the Professional Coin Grading Service (PCGS) to be in Mint State-69 Deep Mirror Proof-Like (MS69 DMPL) condition, a distinction that means your almost-flawless coin will showcase an impressive full strike and indistinguishable imperfections – well above and beyond the quality of the vast majority of coins in the series. KEY FIRST STRIKE CERTIFICATION – Your coin will also be certified as a First Strike (FS) coin by PCGS, meaning that it was among the first struck by the mint and was verified within the first 30 days of issue. AN AUTOGRAPHED LABEL! – Your 2011 Olympic National Park Five-Ounce Silver Coin will also be sonically sealed in an acrylic holder with a white core insert. Inside that holder, you'll find another phenomenal feature – a label hand-signed by the 12th Chief Engraver of the U.S. Mint John Mercanti! The America the Beautiful series has proven extremely popular since it began back in 2010. For those who have been collecting from the start, each release has provided a new and exciting way to discover and appreciate all that America has to offer. The Olympic National Park in Washington is a perfect example of a coin that presents collectors with a scene of America’s natural beauty that would likely be overlooked otherwise. 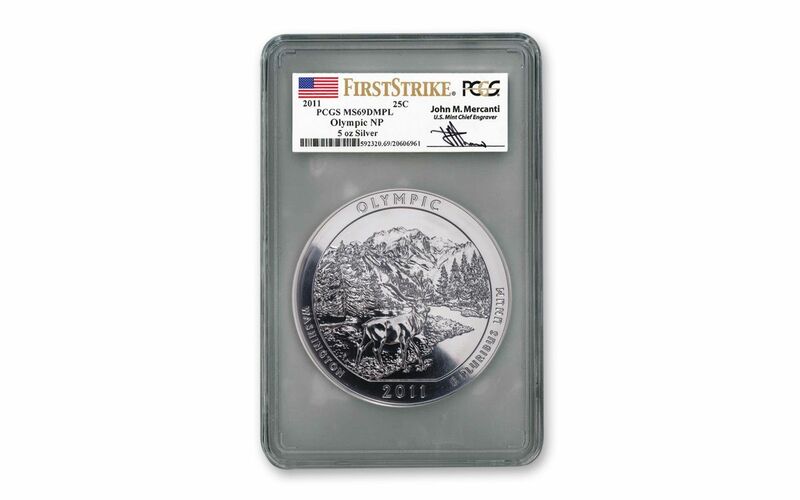 Although the America the Beautiful collection is considered bullion, its five releases every year mean that each new release is only available for so long, so add this Mint State-69 Deep Mirror Proof-Like (MS69 DMPL) First Strike (FS) 2011 Olympic National Park Five-Ounce Silver Coin to your collection before it’s too late!